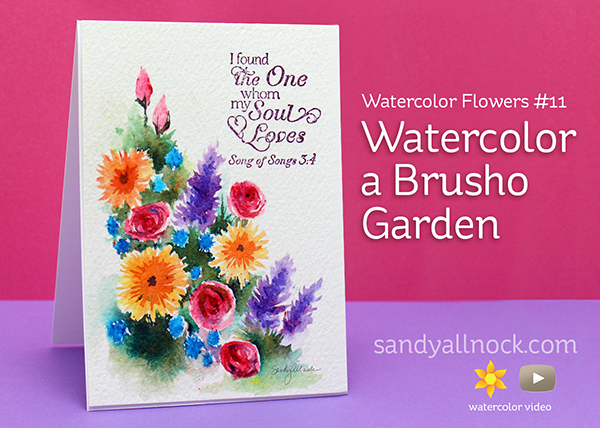 Have you struggled like I have with getting loose with watercolor? See if trying something like today’s project will shake things up a little! Watercolor powders are, by nature, something that makes an artist loosen up. The powders move across the paper in unexpected ways, they have such opportunities for deep, intense color that can quickly drop off to a soft faded edge. Learning to paint images with them is a definite challenge, but has taught me how to use other watercolors in new ways too – I’m learning to love the painted edges, the splatters, the imperfections, so I think my hand is slowly being trained to “Let it go.” [Cue the music. #earworm!] See how I created a sweet little garden of flowers using powders – and maybe give it a try yourself! Watch the video below or click HERE to see it in HD on YouTube. You can do something similar with other watercolors; you can drop color into the puddles of water and move it, but the effect will be different than this due to the ways different kinds of paint move. But I encourage you to give it a try! And FYI hasn’t the Online Card Classes Intermediate Watercolor class been AMAZING this week? Wowsers! I’ve been totally inspired! I found plenty of great info, and I’d suggest it’s a good start even for beginner cardmaking watercolorists. If you didn’t take it “live,” you can join in anytime and see the content, read the forums, and browse the gallery. Everything is open til next Friday, then it’s archived for viewing only – but you can rewatch videos anytime! Stunning watercoloring! I love your watercoloring!! I think I need some brushes. This is so bright and stunning. Your card is gorgeous! I tried it with color bursts and they don’t react the same way! Totally bummed since that’s all I have. I’ll just soften the look under vellum. Oh bummer!!! Maybe I’ll try them on periscope and see if I can figure out what’s up. I would have thought it would have worked! It’s possible I’m just a terrible artist! But when I tried adding more color like you did with the Brushos, it reactivated the color bursts and made everything blend. I’m going to keep trying and maybe it will work! Thanks for the fun ideas! Thank you so much. I’m going to give it a go! You provide such inspiration! Beautiful, vivid colors. Absolutely stunning! This is so pretty. Not sure that my Brushos come out with as much control as yours. Your garden is lovely. Thanks so much for the video. Your garden bouquet is gorgeous! Love the colors and edges. Very pretty and lots of tips here for beginners like myself. TFS! It was lovely to see these beautiful flowers come together. The pace of the video was just right. You make it look so easy. I know if I tried it, it would be a mess, but you’ve inspired me to at least make an attempt. Thank you for the video. Ohhhhh, swooning over these beautiful flowers and coloring. Thanks for the great video. Oh Gosh, what a beautiful card. I might reconsider my thoughts about the brusho. I thought i didn’t need them but after watching your video’s i think i might buy like 3 colors to try them out and see how they work. 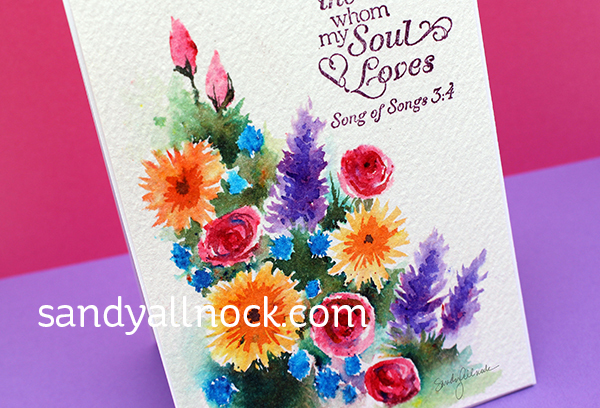 Beautiful card; beautiful color combinations. Thank you Sandy!